Paget’s disease of the bone (PDB) is a chronic skeletal disorder which occurs from overactive osteoclastic bone resorption followed by a compensatory increase in osteoblastic new bone formation that results in a high rate of bone remodeling and abnormal bone formation. The ensuing poor bone quality in PDB can predispose patients to fractures. Impaired fracture healing is also common in the setting of pathologic bone- hence; implant failure secondary to persistently high stresses in the setting of non-union is rather unsurprising. We review management of a proximal femoral non-union in a case of failed fixation for a subtrochanteric femur fracture in a Pagetic patient. When implants for proximal femur fractures fail in PDB patients, total hip arthroplasty (THA) or revision with a new implant is recommended. Not all PDB patients with previous broken hardware are good candidates for THA, based on past medical and social history, and there exist a high likelihood of failure of revision fixation secondary to impaired healing potential. We recommend proximal femoral replacement as an appropriate surgical option for PDB patients who are least suited for THA following failed internal fixation. Proximal femoral replacement, Paget's disease of bone, Subtrochanteric femur fracture non-union, Failed intramedullary nail, Hemiarthroplasty, Total hip arthroplasty, Case study. Implant failure for subtrochanteric femur fractures in Paget’s disease of the bone (PDB) is not unusual. In a study by Bradley and Nade , seventeen out of the thirty-six primary implants used for subtrochanteric fractures failed. When implants fail in patients with PDB, total hip arthroplasty (THA) or revision with a new implant is recommended [2-5]. THA has been shown to be effective in treating femoral fractures in PDB, however not all patients are good candidates for the procedure. Based on the patient’s medical and social history, hemiarthroplasty of the hip may be the most appropriate option. The use of hemiarthroplasty to address failed fracture fixation in patients with PDB has received little attention in the orthopaedic literature. We present the use of a proximal femoral replacement in a patient with Paget’s disease of the bone (PDB) who presented with a broken intramedullary nail secondary to a subtrochanteric femur fracture nonunion. A 65 year old African-American man presented to our office complaining of left hip pain of 1 week. His medical history was remarkable for hepatitis C, stroke with a reported left-sided residual weakness, hypertension, alcohol abuse, cocaine abuse and PDB with some advanced degenerative changes about the hip joint. He had previously undergone intramedullary nailing for a left subtrochanteric femur fracture sustained after a misstep and twisting his hip approximately 3 months prior. His immediate postoperative course was reportedly unremarkable and he was discharged in stable condition without any complications. His last follow-up with his primary care physician however revealed a broken intramedullary rod, secondary to nonunion of his fracture. Plain radiographs of his hip and femur demonstrated a broken left femoral intramedullary nail at the level of the subtrochanteric region where his fracture was located (Figure 1). There was no sign of any callus formation and he was diagnosed with atrophic nonunion. Further examination of radiographs and the patient’s past medical history revealed predominantly sclerotic PDB involving bilateral femora and hips. He exhibited joint space narrowing of his hips with more severe degeneration on the left including periacetabular cyst formation and significant sclerosis throughout the pelvis. 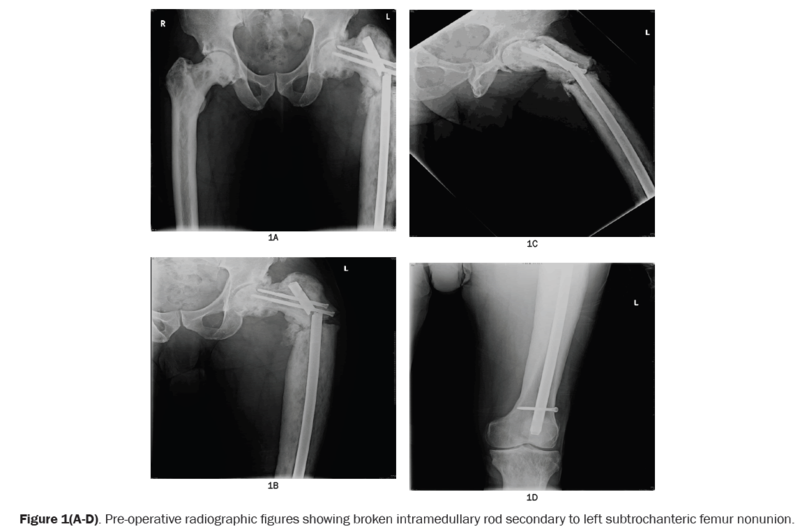 Figure 1(A-D): Pre-operative radiographic figures showing broken intramedullary rod secondary to left subtrochanteric femur nonunion. On physical exam, he had difficulty with active flexion of the hip as well as pain with any passive manipulation of the involved extremity and ambulated with an antalgic gait. His knee exam in addition to the remainder of his musculoskeletal exam was otherwise normal. The location of his fracture and bone quality suggested a high stress riser at the level of the fracture nonunion site, which would require either repeat intramedullary nailing or prosthetic replacement. Due to the patient’s age, fracture site, and past medical history, as well as his social history of cocaine and alcohol abuse, the decision was made to proceed with a proximal femoral replacement hemiarthroplasty. Infectious serologies were performed to rule out any sources of infection. The patient was placed in the right lateral decubitus position on a regular flat operating room table. A traditional posterior approach was performed incorporating the old surgical incisions. 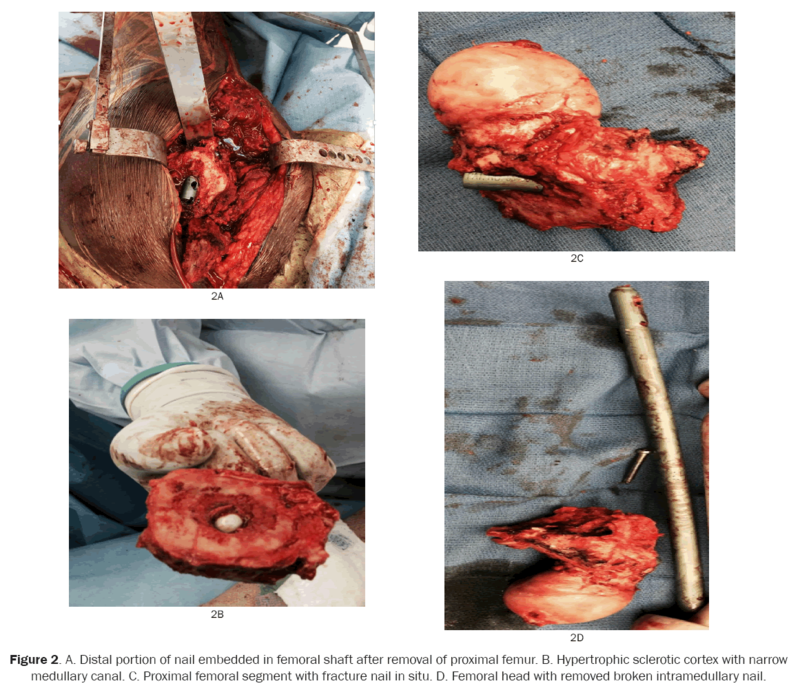 The proximal femur was removed en bloc with the broken nail in situ after releasing the short external rotators and iliopsoas tendons as well as performing a meticulous circumferential capsulotomy to allow for later repair (Figure 2). A saw was used to perform osteotomy of the greater trochanter to preserve the hip abductors and secure it to the prosthesis. Nail removal from the distal segment was performed with a nail extraction device after removal of the distal interlocking screws. Reaming then commenced to allow for a well-seated press fit diaphyseal modular stem to be placed into the distal segment after a saw was used to freshen the fracture site. A conical body was trialed to complete the stem component along with a bipolar femoral head. The iliopsoas tendon was repaired to the prosthesis and the hip capsule was repaired and tied down over the femoral neck in a purse string fashion to augment stability. Lastly, the abductors were reattached using a greater trochanteric claw plate, which was cerclaged to the prosthesis. Figure 2: A. Distal portion of nail embedded in femoral shaft after removal of proximal femur. B. Hypertrophic sclerotic cortex with narrow medullary canal. C. Proximal femoral segment with fracture nail in situ. D. Femoral head with removed broken intramedullary nail. Immediate and 2 week postoperative radiographs showed good component positioning (Figures 3 and 4). The patient was made weight-bearing as tolerated with standard posterior hip precautions with no active abduction or passive adduction in order to protect the abductor repair. 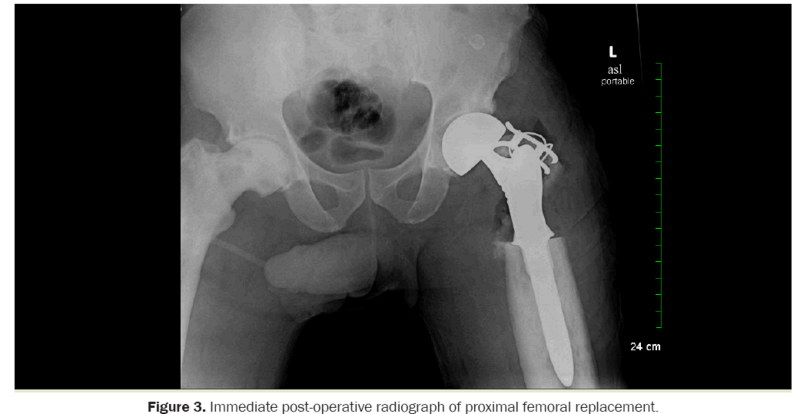 Figure 3: Immediate post-operative radiograph of proximal femoral replacement. 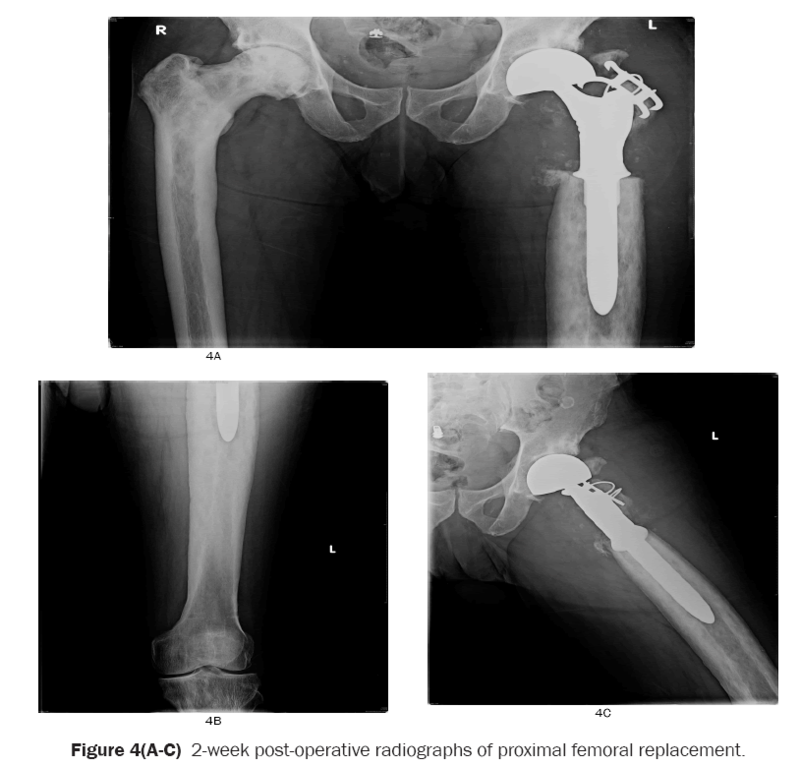 Figure 4: 2-week post-operative radiographs of proximal femoral replacement. Plain radiographs during his 6 month (Figure 5) and 1 year (Figure 6) follow-up visits revealed maintenance of prosthetic positioning with no interval displacement, subsidence or major interval changes. The patient reported good ambulation, albeit an occasional use of the cane, with minimal pain in left leg during his 6 month follow-up visit. He was neurovascular intact, had no tenderness to palpation over the left trochanteric region, and was able to tolerate passive manipulation of his left lower extremity during his 1 year follow-up visit. 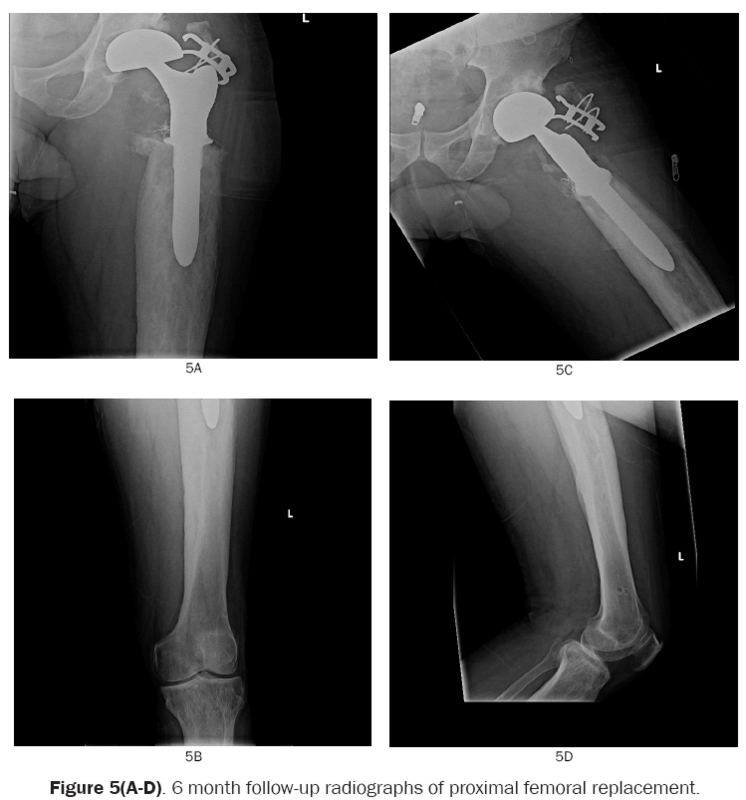 Figure 5: 6 month follow-up radiographs of proximal femoral replacement. 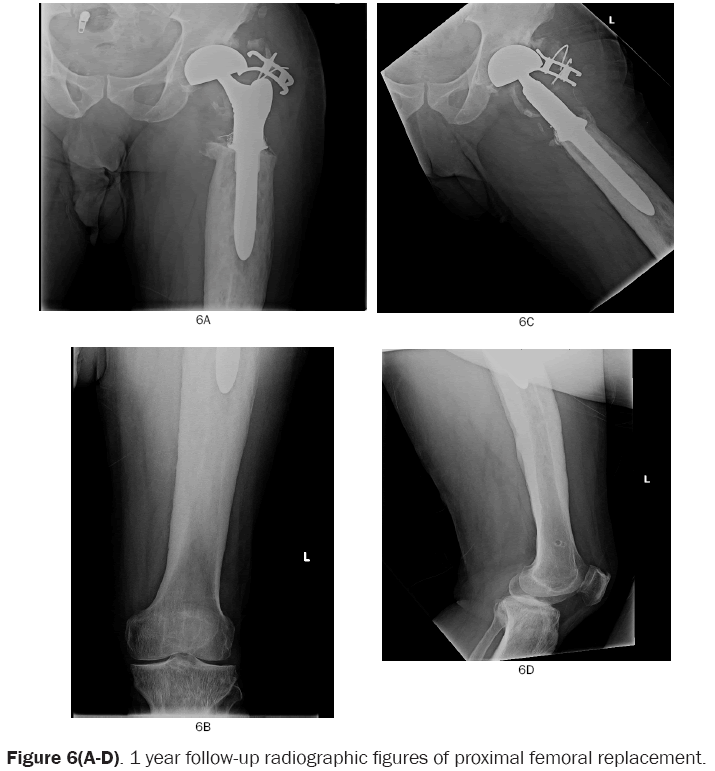 Figure 6: 1 year follow-up radiographic figures of proximal femoral replacement. PDB is a chronic skeletal disorder that occurs from overactive osteoclastic bone resorption followed by a compensatory increase in osteoblastic new bone formation that results in a high rate of bone turnover and abnormal bone formation [6-8]. It is more common in the elderly, with a reported 2.3% prevalence in adults over 65 years and is rare in patients of African descent [9,10]. The poor bone quality in PDB makes pathologic fractures common, usually in the lower extremity, especially the femur and hip . When subtrochanteric femur fractures occur in patients with PDB, intramedullary nails are usually recommended for surgical stabilization [12,13]. Given the pathologic bone in these patients and compromised healing, implants see much more load for an extended period of time and may potentially fail if the fracture does not unite. Our patient had no evidence of bony healing which placed an enormous amount of strain on his previous intramedullary nail. The subtrochanteric femur experiences some of the highest stresses in the body, which also contributed to failure at that site in particular. In the setting of impaired healing potential, it is recommended to consider arthroplasty options. Our particular patient was not that active previously and had a history of prior IV substance abuse-hence the choice of proximal femoral replacement hemiarthoplasty. Though indicated in certain patients, THA should not be performed in all PDB patients with proximal femur fractures or nonunion. PDB patients who have multiple medical comorbidities or those with questionable social histories of drug and/or alcohol abuse and are not particularly active should not be considered for THA due to the numerous associated post-surgical complications of poor wound healing, increased infection risk or potential for instability [14,15]. Hemiarthroplasty with proximal femoral replacement should be considered the more appropriate surgical approach. By performing a proximal femoral replacement, we were able to reduce blood loss during surgery, which could have been significantly higher in THA, especially in the highly vascularized pathologic bone of PDB patients. The patient was also able to obtain mobility and functionality as expected, which is similar to those of THA patients. Dislocation has been reported as the most common complication after proximal femoral replacement [16-20]. Care should be taken to consider appropriate anteversion of the femur as well as length and offset to optimize soft tissue tension and stability. Meticulous capsular repair around the femoral neck in a purse string fashion also should be performed to help decrease risk of dislocation. While THA is the recommended surgical approach for patients with PDB, the treating surgeon should take the complete medical and social history of patients into account and proceed with proximal femoral replacement hemiarthroplasty when necessary. To our knowledge, there is sparse literature outlining this as a surgical option for this scenario and its outcomes. It is our hope that future studies will explore the benefits of proximal femoral replacement in PDB patients contraindicated for THA with a larger sample. Bradley CM and Nade S. Outcome after fractures of the femur in Paget's disease. Aust N Z J Surg. 1992;62:39-44. Sorbie C. Arthroplasty in the treatment of subcapital hip fracture. Orthopaedics. 2003;26:337-341. Ludkowski P and Wilson-MacDonald J. Total arthroplasty in Paget’s disease of the hip: A clinical review and review of literature. Clin Orthop Relat Res. 1990;255:160-167. Merkow RL, et al. Total hip replacement for Paget’s disease of the hip. J Bone Joint Surg Am. 1984;66: 752-758. Rodriguez-Merhan EC. Displaced intracapsular hip fractures: Hemiarthroplasty or total hip arthroplasty? Clin Orthop Relat Res. 2002;399:72-77. Al Nofal AA, et al. Bone turnover markers in Paget’s disease of the bone: A Systematic review and meta-analysis. Osteoporos Int. 2015;26:1875-1891. Rai H, et al. A rare incident of Paget’s disease of bone in early adult life. J Oral Maxillofac Pathol. 2014;18: 147-150. Selby PL, et al. Guidelines on the management of Paget's disease of bone. Bone. 2002;31:366-373. Altman RD, et al. Prevalence of pelvic Paget's disease of bone in the United States. J Bone Miner Res. 2000;15:461-465. Mirra JM, et al. Paget’s disease of bone: review with emphasis on radiologic features, Part I. Skeletal Radiol. 1995;24:163-171. Singer F. Bone quality in Paget’s disease of bone. Curr Osteoporos Rep. 2016;14:39-42. Cave EF. Femoral-shaft fractures treated by medullary nailing. N Engl J Med. 1952;246:284-288. Shardlow DL, et al. Stabilization of acute femoral fractures in Paget’s disease. Int Orthop. 1999;23:283-285. Jolles BM, et al. Factors predisposing to dislocation after primary total hip arthroplasty: A multivariate analysis. J Arthroplasty. 2000;17:282-288. Bierdermann R, et al. Reducing the risk of dislocation after total hip arthroplasty: The effect of orientation of the acetabular component. J bone Joint Surg Br. 2005;87:762-769. Baker RP, et al. Total Hip Arthroplasty and Hemiarthroplasty in mobile, independent patients with a displaced intracapsular fracture of the femoral neck. A randomized controlled trial. J Bone Joint Surg. 2006;88:2583-2589. Haentjens P, et al. Proximal femoral replacement prosthesis for salvage of failed hip arthroplasty: Complications in a 2-11 year follow-up study in 19 elderly patients. Acta Orthop Scand. 1996;67: 37-42. Klein GR, et al. Proximal femoral replacement for the treatment of periprosthetic fractures. J Bone Joint Surg Am. 2005;87:1777-1781. Savvidou OD, et al. Salvage of failed total hip arthroplasty with proximal femoral replacement. Orthopedics. 2014;37:691-698. Malkani AL, et al. Long-term results of proximal femoral replacement for non-neoplastic disorders. J Bone Joint Surg Br. 1995;77:351-356.